Career Ready – Preparing you for the world of work! You will be assigned a mentor (from industry) who will meet and support you throughout your study revealing the different career paths that you could undertake. Employer-led visits, seminars and masterclasses take place throughout the programme providing in-depth insights into your chosen industry. You will undertake practice interviews and curriculum vitae development to enhance your career opportunities. You will complete a six-week paid summer internship providing you with real industry work experience. You will be invited to an official Career Ready graduation to celebrate your success. You will achieve an additional qualification - Level 3 qualification in WorkSkills or a Microsoft Office Specialist exam. Watch our video to hear what the Career Ready programme means to our students! The Career Ready programme is open to students on the Level 3 Information Technology, Level 3 Business or Level 3 Engineering courses. When you start on these courses you will go through an interview and selection process with Grafton Recruitment, Diamond Recruitment or Sensata. 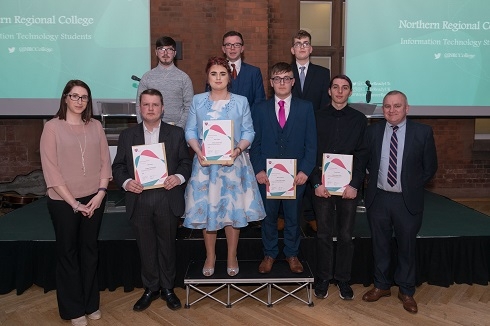 Engineering and Computing were among over 100 young people honoured with awards at the Career Ready graduation ceremony in Queen’s University Belfast. This year awards were presented for Work Placement of the Year and Student Ambassador. Read full story.